Jesus makes a powerful statement in John 5:19 when He tells His disciples that He could do nothing by Himself. His entire life was about being completely dependent on His Heavenly Father in every way. By the sounds of this passage of Scripture, it seems as if Jesus lived a life continually watching His Dad and then He simply reflected what He saw His Father doing. Often in our orphan world system, we define maturity as independence rather than dependence. But in the life of Jesus, we see the very opposite in the mature Son of God. He was happy to live His life in complete dependence upon His Father. Of course, this kind of dependence requires a huge level of trust and trust is something that an orphan mindset struggles with. In order for us to trust God with our all our lives (Proverbs 3:5-6), we will need to be convinced that He has our best interests at heart. I find it interesting how Jesus describes His tender relationship with His Father in the following verse (John 5:20) when He says… The Father loves the Son and shows him all he does. I believe the reason that Jesus lived the way He did was because He knew beyond a shadow of a doubt that His Father loved Him and was delighted to show Him all that He was doing. Since the servant is not greater than the Master, it only figures that you and I would be called to the same dependent life as Jesus lived. In Romans 8:14, we read that one of the defining aspects of the children of God is that they are led by the Spirit. Being led means that we ourselves are not leading, but are simply following the Spirit’s promptings. The reality of the Christian life is that as Jesus could do nothing apart from His Father, we can do nothing apart from Jesus. He is the ultimate source of life and we are simply the recipients of all of the goodness that flows from His heart. This is very good news for anyone who is simply happy to be led. Yet, if we tend to have an orphan mindset, we might not like the complete and utter dependence that this kind of relationship fosters. 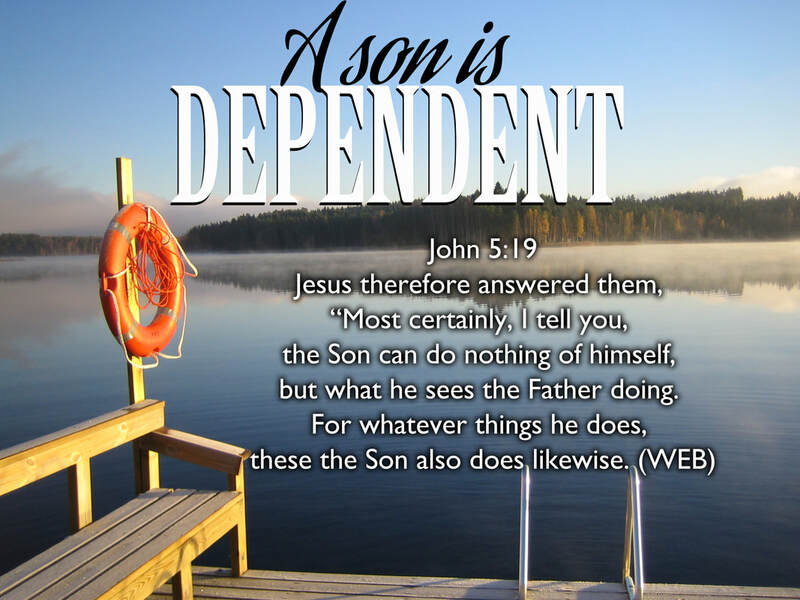 Dependence requires trust. Dependence is strengthened through our own weakness. Dependence leads us to a surrender of all that is self-sufficient in our being. If I were to describe the tension between the Tree of Life and the Tree of Knowledge of Good & Evil in just two words, the words that I would choose would be ‘dependence’ versus ‘independence’. Before the fall, Adam and Eve had it made in the Garden. They didn’t have to try and manage life all on their own. They lived in complete dependence on God to tell them who they were. They were so oblivious to any external influences that they didn’t even know that they were naked. …Until they ate from the wrong tree. After that, everything changed. Separation replaced union. Fig leaf garments replaced the covering of love that they experienced in the garden. Violence replaced protection. The sweat of man’s brow replaced supernatural provision that came from the Father. And ultimately, independence usurped dependence and a world of hurt resulted. And the orphan heart has lived independently ever since. I truly believe that the more we know that we are loved, the less we will live in fear (1 John 4:18). The more that we know that we are cared for, the more we will be willing to yield control of our lives to the One who is love itself. But unfortunately the opposite is true as well. Since an orphan heart does not feel like they are being cared for and watched over, they need to figure out life all by themselves. Since they have no one to depend on, independence is their only option. This is truly a lonely and tiring way to go through this life yet it is totally unnecessary for the believer. A son who knows he is loved, is happy to abide in the vine that flows from the Tree of Life. A son who is satisfied to live a dependent life, needs no external influences to help him try and figure out what is good and what is evil. He simply makes his home in love and drinks freely from the sustenance provided by the vine day and night. My prayer today is that we would all dive in head first into the ocean of complete dependence upon the Triune God! May we be convinced beyond a shadow of a doubt that we have a Father who loves us, an Elder Brother who has joined Himself with us and we have the Spirit of God living inside of us. While we can all try and live separately in the realm of our flesh and our soul this side of heaven, the biblical reality is that every believer in Christ has been joined in a divine union with Him (John 17:23) that will last forever. Because of free will, we can live as if we are alone, but we don’t have to. I think there are many benefits that a trusting life brings that we can enjoy this side of heaven! We read about them in the fruit of the Spirit attributes found in Galatians 5:22-23. My hope and my prayer is that we all would be more rooted and grounded in love than ever before so that childlike trust in our Abba could be restored. I pray that the love of God would set our hearts more at rest today than yesterday. May His abiding love reassure us so that we would know that we not alone in this world and that we don't have to try and manage life all by ourselves. We truly are just little kids with the best Dad in the universe! May we see the glorious simplicity of dependence! He leads, we follow. He initiates love, we respond in kind (1 John 4:19). When God is not moving, neither are we. With eyes fixed on the author and perfecter of our faith (Hebrews 12:1-2), we simply follow His lead. After all, apart from our Big Brother, we can do nothing!